Lucy and Trevor grew up together in Seven Dials depending on each other for survival. When Lucy turns eleven and her mother threatens to sell her, Trevor finds a way to save Lucy. Separated through the years but never out of each other's minds and hearts, Lucy and Trevor navigate life. On a dark and stormy night Trevor answers his door to find a soaked adult Lucy asking for his help. As the two reconnect they begin to learn all the ways that life has changed them and all the ways it hasn't. For two people who have fought to change their destinies, they're about to find out that some things are just meant to be. 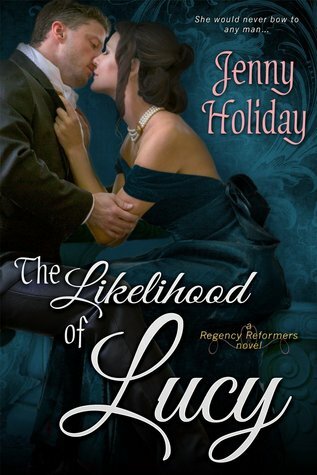 The Likelihood of Lucy is book two in the Regency Reformers series and can be read as a standalone. The couple from book one flitters through this one but Lucy and Trevor's story begins here. Like in book one with the heroine being an abolitionist, Lucy is our reformer and a staunch supporter of women's rights. She can quote Mary Wollstonecraft at a drop of a hat but this talent and beliefs have made her job as a governess for the right leaning aristocracy rather difficult. It is when the father of her current charges confronts her about her teachings and attacks her that she finds herself in dire straits. I liked Lucy and her passion for her cause, the way the character came alive when she was able to discuss her thoughts and feelings on topics was uplifting and poignant to see a woman of this time try to stretch her wings. I once again could see faint rumblings of a heroine character in the same vein of Courtney Milan's amazing woman characters. Outwardly there seemed to be a lot to our hero Trevor, his rise from the slums, his military service, business ventures, and paired with his broody, dark, protective, and fierce personality I was practically salivating to get to know him. All of his characteristics were touched on but just that, I felt like his character could have been delved into even more; he was extremely compelling. In fact, that was what I had a problem with the most, we have these two interesting characters that only get more interesting when together but they didn't seem to spend enough time together. I felt like I was trying to kick start a motor, the story would ramp up but then kick off. When Trevor and Lucy first meet back up there was this wonderful tension and anticipation of a slow burn starting but then the story kept separating them. There was a murder mystery added, Lucy's vindictive former employer, and a faint love triangle. The murder mystery plot line gave the story a sense of directionless for a lot of the middle and I missed our couple being together. When our couple was together they worked, oh boy did they work. It was refreshing to read about two "normal" people and escape the aristocracy laced ballrooms. The few flashbacks to Trevor and Lucy's childhood were endearing and gave more of the depth I was looking for. The quiet scenes between our couple moved from emotionally touching, tension filled, to arousing. The scene with Lucy looking at Trevor's tattoos will not soon be forgotten because of the emotional aspect and sexual heat. These two have "It" and I wish the story would have showcased them more together. If you also want to read about someone other than a Duke, I definitely think Trevor's attributes compensate nicely for lack of a coronet. I'm definitely looking forward to the next in the series and the next cause our heroine will be championing. This author writes commanding scenes between her couples, I just hope there are more of them in the next book.